In this next series of blog posts, I am going to change the format somewhat. In my previous posts, I wrote chronologically, as it made the most sense. As is common in film or video production, filming is generally done out of order. So if I chronicled my experiences in their actual order, it might be a little confusing, so I have decided to talk about my experiences in the same order they occur in DBA in Space episodes, starting with the DBA in Space trailer. On the DBA in Space website, as part of the competition, you were asked to answer 14 questions in 14 different episodes. Technically speaking, there were 9 direct questions and 5 task-related questions. The 9 direct questions had to do with your knowledge of science fiction and space, and could be answered by searching the Internet, and in some cases, using a little math. The 5 task-related questions were tasks that you had to perform with Red Gate’s products in order to answer them. These tasks used essentially fake versions of Red Gate products that did not have to be installed on your computer, and were very easy to answer correctly if you just carefully examined the screens. We referred to both types of questions simply as questions on the DBA in Space website so people would not be confused. The direct questions were asked on Mondays and Wednesdays, and the task-related questions were usually asked on Fridays. The direct questions were asked by me or Miss Friday, and the tasks were generally asked by Miss Friday (aka Verity Blunt). In fact, Miss Friday gets her name because she presents the tasks every Friday. In case you missed this from watching the episodes, the Roddenberry Launch Center has a museum with lots of exhibits, such as the Lunar Exhibit or the History of Computer Exhibit. All of the direct questions were asked from one of the many exhibits, while all of the task-related questions were asked in secret, non-disclosed locations found throughout the Roddenberry Launch Center. The trailer was filmed in the Lunar Exhibit of the Roddenberry Launch Center. If you haven’t viewed the trailer yet, do so above before reading any more. While most film trailers promote some feature of the film, we decided to take a different route and film a trailer that deviated from the script, as we didn’t want to give away any clues about what might happen in future episodes. What was also interesting was that I didn’t know what the teaser was myself until the night before the filming. They had been considering two different options that I was aware of, and it was only the day before the filming of the trailer that the decision was made to go with the astronaut concept. This is not me, but a prop for the set. Doesn’t the building used for the set look futuristic? At the 7:00 AM call on Wednesday, after two days of filming, I walked into the dressing area to see a huge box. 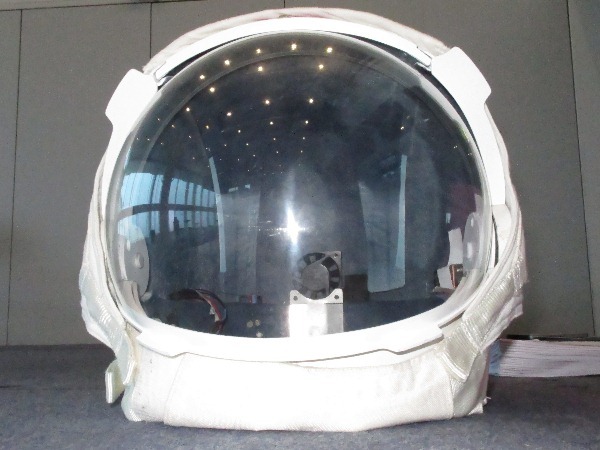 Inside the box was a very good replica of an Apollo spacesuit, which I was going to wear. Putting on the suit was a big challenge. It had many, many parts and they all had to be assembled according to the instructions that came with it. First, I put on the outer suit, which had about an half an inch of insulation. 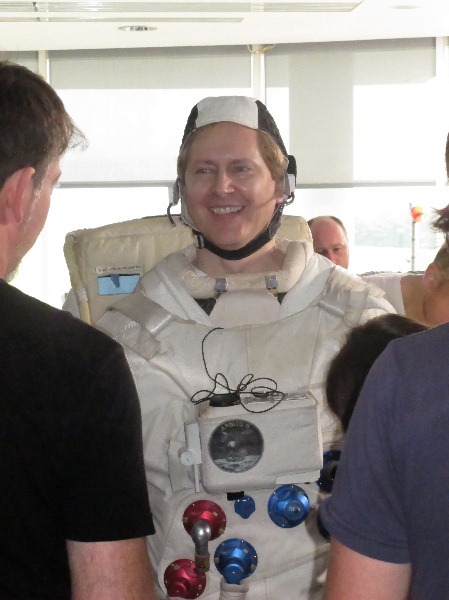 As you might guess, it was very hot inside the suit, and I ended up being in the suit for nearly three hours. Putting on the suit was the easy part. All of the rest of the pieces had to be installed for me by others, as the suit was so bulky. I am all suited up, except for my helmet. The next piece to be put on was a hard plastic piece that you can’t really see very well, as it is mostly covered up by the suit, although if you look hard in the above photo, you can see the top part of it around my neck. It is used to attach the helmet to the suit. The only problem was that the hole cut out for the head was too small for my big head. After a lot of contortions and stretched facial parts, I finally got it on. Later, the front pack was installed, the large backpack was installed, gloves attached, and various tubing attached to all the correct places. The only things left were the boots and the helmet. Inside the fake boots were tennis shoes about three times smaller than my own feet. I managed to force my feet into them, but it was painful to walk with them. And last of all was the helmet. It attached to the piece around my neck. Once I was sealed up in the suit, it was very uncomfortable. Not only was it hot, there was no ventilation, my feet hurt, and piece around my neck forced my back into a strange shape which caused my back to hurt. Overall, the suite weighed about 40 pounds. The suit was very restricting and it made it very difficult to move around. In fact, I had to get someone to lead me around so that I didn’t bump into anything. In addition, while I could close the helmet’s mask, I was unable to open it, needing help because the gloves prevented me from getting a grip on it. The face plate of helmet became fogged up very quickly. Between takes, someone came and wiped it clean. Imagine a strange hand between your face and the face plate, and you will know how I felt. Although you couldn’t tell it from the trailer, there were lights inside the helmet that lit up my face. Notice that there is a fan in back of he helmet for ventilation, but it wasn’t used. Don’t know why. Unfortunately, after the suit was finally all assembled on me and ready to go, the set wasn’t ready to go. So I took off the helmet, gloves, and boots and waited by an open window to try and keep cool. Eventually, the set was ready, I was then reassembled and brought to the set, where you see the action that takes place in the trailer. In most parts of the episodes, I literally followed the script to the letter, not improvising, as it was hard enough as it was to remember my lines without having to think about improvising. Nell Mooney (Miss Friday) is a great improviser, and many of the scenes with her were improvised and very funny. I only mention this now as there were three times in the film where I did some improvisation, and this trailer was one of them. The script called for me to just stop walking on the fake moonscape after I am “caught” by Miss Friday. This is what I did for the first two takes. But in the last take, instead of just standing there, I decided to continue to pretend to walk on the moon, even after being caught. This was funnier than the previous takes, and was used in the trailer. Miss Friday (Nell Mooney), Jar Jar (Poppy), and me in the space suit on the “Lunar Exhibit” at the Roddenberry Launch Center. Above you can see Jar Jar (Poppy) in her costume. 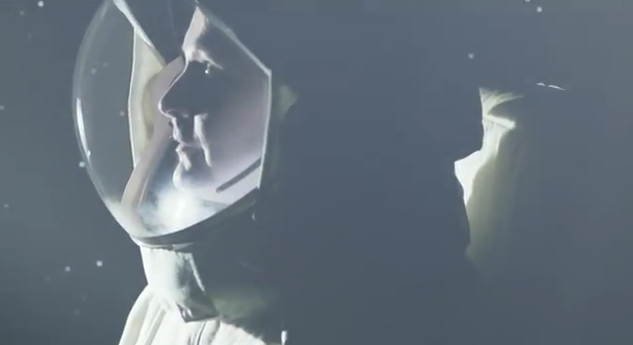 Although Poppy had never “acted” in a video before, she did very well, even with the silly space suit on. In fact, I think she is a better actor than I am. 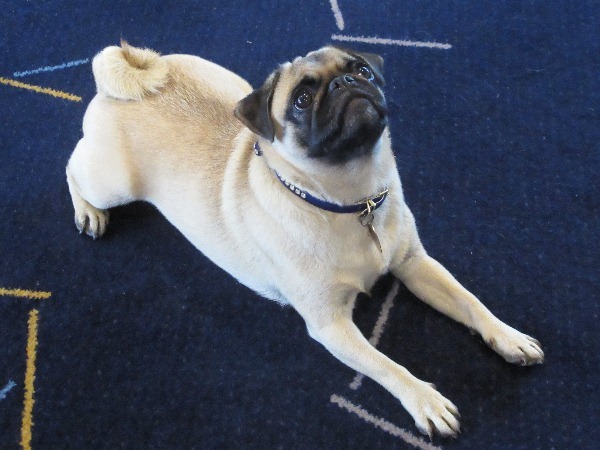 Poppy (not in costume) is owned by the costume designer who worked on the set. There was one part of the trailer that cut from the final version, Originally, as part of the trailer, you were supposed to hear me say, “It’s one small step for DBA, one giant leap for DBA kind. This line was recorded in a recording studio—more about the studio in a later blog—and then modified to sound like Neil Armstrong’s version when he first set foot on the moon. You might ask why I said “DBA” instead of DBAs”? This is because when Neil Armstrong said his famous words, he used the singular word “man”, not “men” which is the correct grammar. So we decided to go for authenticity and also make the same grammatical mistake. But in the end, it was not used in the trailer. I think it was cut because it did not fit it well with the music, which, by the way, was an original composition from someone at The Mill. After nearly three hours in the suit, when I finally got out of the suit, I was drenched in sweat. 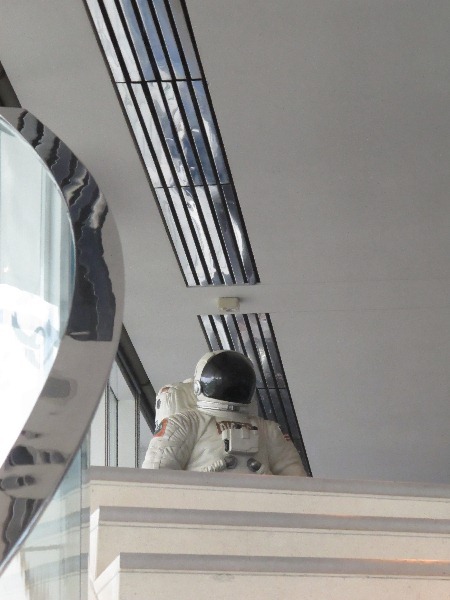 But in spite of it being very uncomfortable, being in the space suit was one of the best parts of participating in the filming of DBA in Space. After all, how many opportunities in life do you get to wear a space suit? In the next installment, I talk about filming question number one. I’m rivited by this whole story. I’ve read your books so it is fun to see this non-technical story from you. Also very cool to know that some of us geeks get a chance to do things like this. It was a very interesting experience, and I have more blog posts coming. Hope you enjoy them.